Add several cordless handsets to a corded base. Ringer and voice mail options. Call waiting and caller ID options. Here I am going to review top 3 best 2-line cordless phones available in the market – Uniden TRU8866, Panasonic KX-TG6700B, and AT&T TL76108. These three are the best fully loaded 2-line cordless phones available today with a 5.8 GHz digital spectrum. These phones offer strong signals round the clock and offer great sound clarity. , Common features of these models are – call conferencing, caller identification system and call waiting. These phones are great for small to medium business and even home-based small business. Read the review here and choose the best 2-line cordless phone best suitable for your needs. Capability to hold 5-way conference calls – This feature is very useful for over-the-phone meetings and discussions. Great LCD display – The crystal clear LCD display helps you when you programme the phone, set-up the caller identification system, and utilizing the several other on-screen features. The system is expandable up to a total of ten handsets. With such great features, this 2-line phone system is worth its price and a must-have for any office or business. Is expandable up to 8 handsets that can be associated with the base system. Phone-book sharing capability that extends across all the phones connected to the system. Overall, the Panasonic KX-TG6700B 2-line cordless phone is very economical and cheap and is great for people who don’t need too many features. The AT&T TL76108 is somewhere between Uniden TRU8866 and Panasonic KX-TG6700B in terms of price and features. The system offers lesser disc space on the answering machine and also the battery life is not too good. This model is not even wall mountable. This 2-line cordless phone is expandable upto 8 handsets. The system requires only a single phone jack and comes with a spare battery charger. While the Uniden TRU8866 is little expensive, it is worth its price for its great features. It is best suitable phone for most business houses. 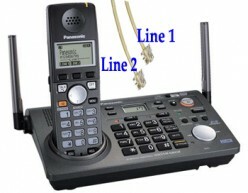 It is best for people who are looking for additional great features in a 2-line cordless phone. The Panasonic KX-TG6700B is economical and affordable 2-line cordless phone and offers good value for money. It is best for people who don’t need those extra features. This model is also best for use at home. The AT&T TL76108 needs some improvement before it gets recommended for business of home use.